Ed is a technology business guy turned lawyer. He’s written software, designed circuits, and worked as a product marketing manager, and has been a business lawyer for the past 24 years. Because of his experience inside technology businesses, he’s been representing entrepreneurs since he became a lawyer. In that role he’s has seen the good, the bad and the ugly in high growth venture backed companies, as well as closely held multi-owner businesses in general. Ed has successfully completed equity capital transactions, co-founder agreement arrangements, growth acquisitions, and exits. 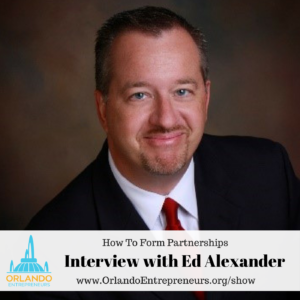 As the founder of Alexander Abramson, PLLC (formerly Entrepreneurship Law Firm), in Orlando, Florida, Ed has represented closely held businesses and professionals in corporate, business, and commercial law, securities, technology and intellectual property licensing, and corporate finance. Since becoming a lawyer in 1993, he has been primary counsel to clients for business acquisitions and sales, financing transactions, technology licensing and intellectual property assets, creation of partnership agreements, LLC operating agreements, shareholder agreements, employment agreements, and stock-option plans. He is admitted to practice law in both Florida and New York. Ed is the author of two books: The Guide to Selling Your Florida Law Practice (2018), and10 Common and Costly Business Killing Legal Mistakes and How to Avoid Them: A Business Law Bible for Entrepreneurs (2010). Ed is also a Florida licensed business broker and a shareholder of Fitzgibbon Alexander, Inc., a Central Florida consulting, business valuation, and business brokerage firm. Prior to attending law school, Ed held technical and business positions with technology companies, including with a pacemaker manufacturer, custom integrated circuit manufacturer and laser bar code manufacturer. He has been part of teams that coded software and designed hardware for the first generation of defibrillator pacemakers, as well as custom analog and digital integrated circuits used in, among other applications, automobiles and hearing aids. In 1995, Ed was awarded U.S. Patent, No. 5,468,952, for his 1992 invention of a combined miniature high-speed scanner and portable handheld computer. Ed is the 2018 Chair of the Small Business Resource Network of the University of Central Florida Small Business Development Center, has taught New Venture Finance as an Adjunct Professor for the University of Central Florida (School of Business), and was 2007 Chairman of the East Orlando Chamber of Commerce. He volunteers with the Orange County Legal Aid Society as a guardian ad-litem for abused and neglected children. In 2014, Ed was awarded the Orange County Legal Aid Society Distinguished Service Award for his long term dedicated services to the Central Florida community and contribution of time and professional skills. Ed’s passions include mountain and road biking, kayaking, and backpacking.